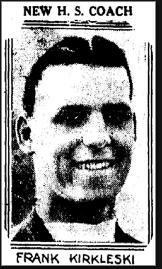 Frank William Kirkleski was born May 19, 1904 in Nutley. A quick and powerful athlete, he distinguished himself as a member of the Nutley High School football team alongside Jack Speary, another local legend. He also played basketball and baseball. 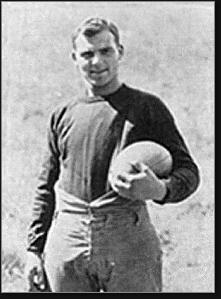 Frank was recruited by coach Jock Sutherland of Lafayette College, a disciple of Pop Warner. He loved the way “Kirk” plowed through his tackles. Frank was one of a group of young stars—including Charlie Berry—who vaulted the Leopards into national prominence in the early 1920s. Frank made his mark in 1923 as a freshman with a long touchdown run against arch-rival Lehigh. The speedy halfback and strong-armed passer was a key member of the varsity for four seasons. The last three were coached by Herb McCracken. Frank was part of the team that first made use of the modern-day huddle. It sailed from pole to pole. In 1926, Frank captained Lafayette to a national championship. He and George Wilson formed the heart of an awesome backfield, with Wilson setting an NCAA record with 20 touchdowns. Both players earned All-America recognition. Lafayette did not lose a home game during Frank’s four seasons, and went 29–4–3 overall. As the team’s defensive leader, he took great prode in the fact that Lehigh did not score a single touchdown against the Leopards between 1923 and 1926. Frank also played four years of baseball for Lafayette and two years of basketball. The Pottsville Maroons signed Frank after graduation and in his first NFL game, he threw two touchdown passes. He also made he winning plays in two victories over the Providence Steam Roller. Pottsville finished the 1927 season with only five wins, including a win over Ernie Nevers and the Duluth Eskimos. Frank moved closer to home in 1928, suiting up for the Orange Athletic Club, a good independent team. In 1929, the city of Orange fielded an NFL team, the Tornadoes and Frank led the team in scoring. This team was noteworthy for using letters instead of numbers on the players’ uniforms. The Tornadoes moved to Newark in 1930 and won only one game. Frank scored the team’s lone rushing touchdown that season on a 50-yard run. He also threw tow of the Tornadoes’ three TD passes. Frank’s final pro campaign was in 1931 for the Brooklyn Dodgers. He played in just three games. Frank moved into coaching in the 1930s, first as an assistant at his alma mater, Nutley High, and then as head coach of Woodbridge High School, where he also taught history. At the same time, he earned a Masters in economics at NYU. He left after the 1934 season to pursue a business career. The man who replaced Frank, Nick Priscoe, coached for nearly three decades. Frank also coached Thomas Jefferson High in Elizabeth. Frank kept his hand in the pro game during the Great Depression, acting as coach of the Paterson Panthers of the American Association. They were a regional powerhouse under his tutelage, going 12–2–1 in 1937 and 11–5-–0 in 1938. In 1939, Frank led the Panthers to the league championship game against the Newark Bears. Newark won 27–7. Frank passed away on May 6, 1980 in Chatham at the age of 75.